A myth about waking up early is "Wake up Early in the morning means an early bedtime" It's not really true for every time. 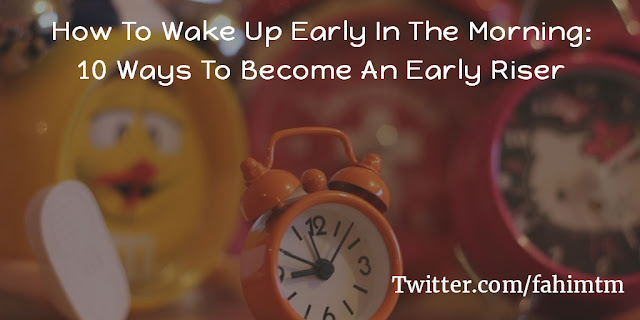 There are many ways to wake up early in the morning if you sleep late. I'm a night owl, but I can wake up early in the morning if I want. You can change your life by waking up early, it's just like magic. If you never see the morning sky, then you missed half of your life. You should start practicing on how you can wake up early in the morning. I have experience of practicing to become an early bird from the night owl. Today I'll give you only those suggestion and tips what actually worked for me. 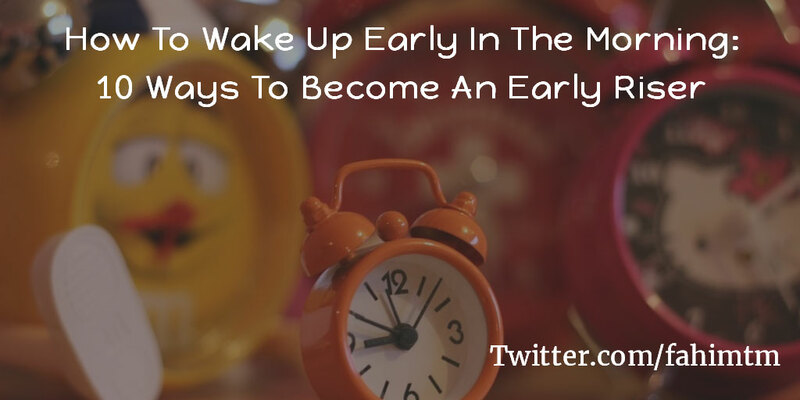 So this post is not only to write a blog post, it's a practical judgment too on how to become early birds. If you can become an early riser, then you can change your life positively. You can boost your work productivity. Waking up early is a great medicine of self-improvement. You maybe missed many important things of your life just because you can not wake up early. So being early birds is too important for some time. If you are reading this article, then you should not be worried anymore. You will learn the secret keys to become an early bird. Now lets talk about how actually it works. I wish you could be an early riser in the next three weeks. If you can find the reason in the given list then remove it from your life for one week. And follow the below tips. If you are unable to find the reason in the above list and even yourself, then also follow the below tips. 3. Set your goal for the morning: Setting up a goal for the morning is important. You can not skip this option. Give your brain a reason to be active in the morning. Something like you have to see the first sun shine of the day. Or you have to go station at just 7 A.M. Its not hard, think about the morning. 4. Be Excited: Excitement is a great practice for this. I'm sure there are lots of reasons which can make your brain excited, but you don't know how to turn them into your waking medicine. Give your brain a super compelling reason to become excited when your clock alarming. Sometimes this practice doesn't need a clock alarm. Tell your brain something you are incredibly passionate about and going to do that. Below are some example for getting Idea on how you can make your brain excited to wake up early. Think you have an important meeting at morning 7 o'clock. You will be fired if you missed it. So if you can believe that this seriously your brain will ultimately be activated before 7 A.M. If you have Girlfriend/Boyfriend think you have a date at 8 A.M., You can not miss the special moment. Believe that you have to get into the train at 7:30 A.M. There is no other option to transport you for the day. Start yoga practice at morning and remember you can not miss any morning to do this. I'm sure you have many more reason to make your brain excited. Build up your brain that you must have to wake up early morning, prepare your mind with excitement the night before, so when it’s time to wake up you are still on steroids. 5. Environment Advantage: Make sure you are getting the morning lights by the window. Don't Block all sources of light came into your room when the sun rises. The shade of lights will help your eyes to wake up. 6. Set the alarm: Set an alarm to the clock and put it near your bed, but make sure the distance you can not touch the clock without stand up from the bed. Because I saw many time when my alarm tried me to wake up I just shut it off while it started sounds and I'm still closed my eyes. And again I slept. 7. Don’t aim too high: You can not change your lifestyle in only one day. It's not possible. Don't hope that after reading this article you will wake up at 5 A.M from tomorrow. Set your ambition to a one-month goal. You may want to go for a walk every morning, but it will be hard to start from tomorrow. Try in next 5 days... remember smaller steps can bring your bigger result. 8. Not to worry: Building a habit takes few weeks. Some expert says that it takes minimum three weeks and maximum 7 weeks depending on a persona, aim, work, stamina, and real practice. You need not be worried, stay on track, you will build your habit to wake up early. Don't go back if it does not happen in three weeks. Don't feel you are not gonna do this. 9. Don’t snooze: The Snooze Button Is Ruining Your Sleep! If you don't have a sound sleep, it may break your hope at morning. If you have snoozing habit, then it's hard to stop snoozing. It's really hardest one. But you have to stop it. 10. Jump out of bed: Yes, jump out of bed. When you hear the first sound of alarm jump out from the bed. Say yourself that you should not sleep anymore. Tell yourself that you are not sleeping you are alive. Trust me, it works seriously. Exercise helps a lot to become an early riser. Do practice all these tips and find what works better for you. Early rising means a healthy mind and body. Create a bedtime ritual. A bed time ritual will set your thoughts to warming your mind in the morning. Drink tea or coffee immediately after waking up. Change your attitude if you have any anti attitude to being an early bird. Do you have any further tips how to get out of bed? I would like to here from you. Comment below or if you want to write a featured guest post, please use the contact form and send me your article via email. I'll love to post it with a link back to your website or social channel whatever you like. Don't forget to share this article on social media, millions of night owl might get help by your sharing. Help your friends to become an early riser too.